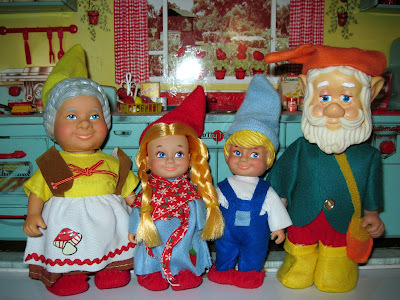 One of my favorite vintage gnome items is also the only one with links to my childhood. I can remember seeing this family of gnome dolls advertised in the big Sears Christmas Wish Book back in the 1970s. I believe I actually tore the page out, circled the gnomes in thick, red marker, and included it with my letter to Santa, just to be sure he knew exactly what I wanted. I can still remember going to bed every night that December, anxiously worrying about the gnomes: did Santa get my letter? Would he have enough of the gnome dolls in stock for all the children who would undoubtedly be asking for them that year? Would I pass muster on Santa's list, and be deemed worthy of said gnomes? Well, I must have had a pretty good year, because Santa dutifully brought them, and I played with them incessantly. My childhood gnomes didn't survive, unfortunately, but thanks to eBay, I have them back today. 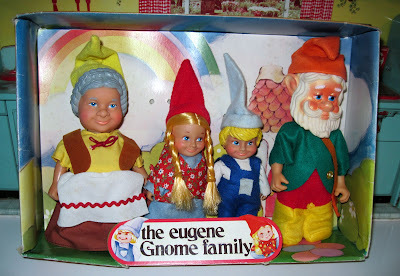 Designed by the Eugene Doll Company of Brookyln, New York in 1979 and manufactured in "The British Crown Colony of Hong Kong," the 5-7 inch tall jointed gnomes are made of plastic with clothes of rather cheap synthetic materials. The clothes were embellished with stickers (a mushroom on the mom, a strawberry on the girl) that quickly fell off and were invariably lost (one of my eBay sets miraculously retains them). The Eugene Gnome Family was definitely not a high-end toy, but there was, and remains, something very captivating about these dolls. As a little girl, I absolutely treasured them, and I still do today. 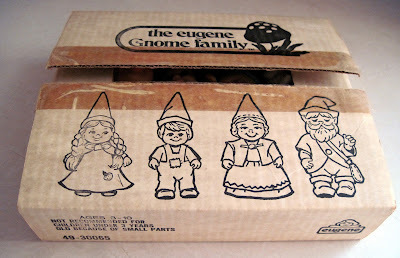 The Eugene Gnomes were packaged in two different ways, a fact I was unaware of until I began hunting for them as an adult. The first variation is this display box, which is how the gnomes were sold in stores. It has some gnome folklore on the back, and suggests: "Keep them with you to lend a hand, to talk to, to pretend with, to have as friends. Invite the whole Gnome family -- they'd love to come." The second packaging variant is this much smaller mailing box, which is how I remember my gnomes coming on Christmas Day as a child. There was no display box inside: the dolls were simply packed, loose, into this carton. 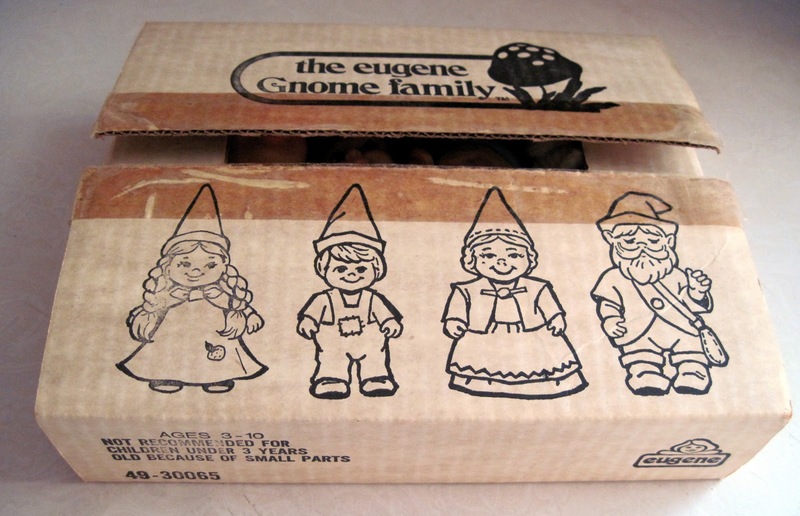 This is how the gnomes were packaged for catalog sales, which is how the bulk of midwestern American Christmas toy shopping was done back in the 1970s. This dual packaging, one for stores, one for catalogs, was typical of many toys back then, but it can be puzzling if you're not aware of it, as I wasn't when I began my gnome hunt. It was like Christmas 1979 all over again the day this came.